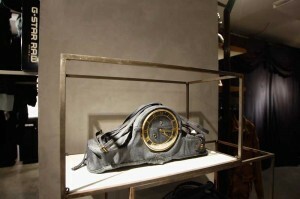 CANNES, May 25, 2012/ — As part of the celebration for the grand opening of its flagship store in Cannes, the G-Star presented the travelling Denim Museum, containing the RAW Art Series that contextualizes denim as collectable art objects. Included in the opening event was also the G-Star Pop-up show, transforming a catwalk show into real live interaction on a mini scale. The store was officially opened by G-Star’s forthcoming campaign face, American actor Caleb Landry Jones and English singer-songwriter Anna Calvi.